The main umbrella group of Sri Lankan Muslims says radical Buddhists are trying to damage peaceful co-existence between the country's main ethnic communities. The statement came three days after hardline Buddhists tried to storm a mosque, after which the government said it would be demolished and relocated. 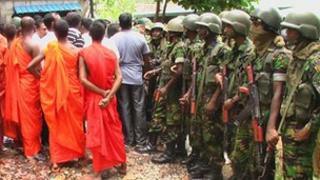 Buddhists in the central town of Dambulla have defended their actions. But the issue has provoked anger among some prominent Muslims. The Muslim Council of Sri Lanka said it was "deeply concerned" at the attempted destruction of the mosque in Dambulla last Friday. It said the building was lawfully registered and was 50 years old. The council said that radical Buddhist elements - against the will of the majority - were consistently undermining ethnic co-existence. It called on leaders of Sri Lanka's majority Buddhist faith to re-establish good ties. Mohamed Saleemdeen, a board member of the mosque, denied it was an illegal building. He told the AP news agency that it had been there long before the area was declared a sacred zone about 20 years ago. But prominent monks in Dambulla say the mosque is illegally built on ground sacred to their religion. On Friday the building was fire-bombed. Video of monks and other hardliners trying to storm it later showed one monk addressing the crowd in overtly racial terms, saying the campaign against the Muslim building was a victory for "those who love the race, have Sinhalese blood and are Buddhists". The BBC's Charles Haviland in Colombo says that a monk was seen exposing himself against the mosque as an insult. Buddhist leaders in Dambulla say they now intend to demolish 72 structures in the sacred area that they say are unauthorised, including the mosque and a Tamil Hindu temple. A Dambulla monk told the BBC that the actions were necessary because Sri Lanka was "the only country to safeguard Buddhism". He said that if encroachments continued there would be no Buddhist land left. President Mahinda Rajapaksa is overseas but senior Muslim politicians from his government have condemned the official decision to demolish the mosque. While most of Sri Lanka's Sinhalese majority are Buddhists, Muslims are regarded as the third ethnic group, after the mainly Hindu Tamils. There have been appeals for calm, including from a Sri Lankan Muslim blogger who said it would be irresponsible for Muslims to respond to current events in a "reactionary" way.